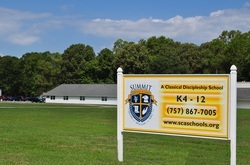 Summit Christian Academy is located in Virginia’s Hampton Roads region, which spans a 40 mile radius that encompasses several historic cities from the Virginia Beach oceanfront to the first English speaking settlement at Jamestown. It is a bustling community that includes one of the world’s busiest harbors, the world’s largest naval base, the world’s largest private shipbuilding operation, a nationally ranked golf course, and nearly one hundred museums that cater to art enthusiasts, maritime and military history buffs, scientists, athletic fans, and children’s interests. Hampton Roads is also a thriving business sector whose major employers includes Huntington-Ingalls Industries, NASA, and several universities and military installations. 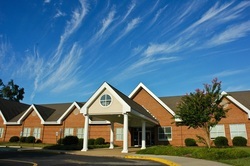 Established in 1996, Summit Christian Academy is a classical and Christian school. We have about 200 students in grades K4-12. Summit’s classical curriculum includes Latin in grades 3-8 followed by French and Spanish in High School and courses in Formal and Informal Logic, Debate, Speech, Research and Thesis. During the Dialectic years students construct and critique arguments, recognize fallacies, identify underlying assumptions, and develop sound reasoning skills. At the Rhetoric stage, the curriculum emphasizes the synthesis of ideas, research, independent thinking, creativity, and eloquent persuasive communication. Each senior is required to present and defend a Senior Thesis before a board as a capstone to their education. Students hone higher order thinking skills by synthesizing information and evaluating disparate ideas. The Senior thesis provides graduating students with a unique opportunity to research, prepare, present, and defend a thesis in front of an adjudication panel. Not only does the senior thesis require our students to defend an issue about which they feel strongly before a live audience; it also forces students to comprehensively research both sides of an issue, to seriously consider alternative viewpoints, and to vigorously defend their findings in an engaging oral and visual presentation. Students who earn an advanced diploma are required to take four years of science, math, English, and history; three years of a single foreign language or two years of two languages; as well as two Honors Level electives chosen from the following coures: English 9 – 12, College Algebra, Pre-Calculus, Applied Calculus, Statistics, Advanced Chemistry, French IV, Spanish IV, and Sociocultural.